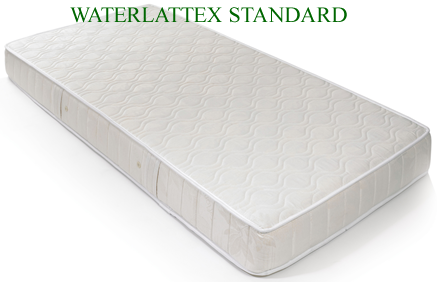 The Waterlattex is a premium quality highly supportive mattress, made to high environmental standards. Popular throught out Europe the Waterlattex gives years of excellent support and gets many word of mouth reccomenadations, both from satisfied customers and health professionals. Waterlattex is not a memory foam and does not suffer with the heat problems that some people seem to suffer with memory type foam. Delivered roll packed so easy to move upstairs. The Waterlattex is 17/18cm deep and upholstered in a Cotton damask type material.. 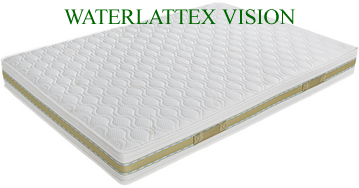 The Waterlattex Vision has the same core material as the Waterlattex the natural so shares all its benefits however it has a non removeable stretch Coolmax cover, the advantage of this cover is that it helps the mattress mould to your body a little bit more and makes the Waterlattex vision feel a tad softer, though retaining the high levels of support. The Vision also has a 3D breathable band around the edge of the mattress. The Waterlattex vision is 17/18cm deep. some people like the deeper look. Off course it also has all the advantages the Waterlattex vision has as well.